Remember, Turkish forces were supposed to be going in to Syria to fight Daesh. But there they were, engaging in combat at Amarna with the SDF, which is backed by the US Department of Defense, which has 200 US special operations forces embedded with it, and which had itself taken heavy losses kicking Daesh out of Manbij. These actions help answer the question I posed Thursday, about whether the Turkish incursion is really aimed at stopping the Kurds from consolidating their mini-state of Rojava in northern Syria rather than mainly targeting Daesh. “Furthermore, the Turkish-backed [fundamentalist] Sultan Murad brigade captured three SDF fighters in the Turkmen Yusuf Beg village, publishing a video beating them on camera, calling them ‘PKK dogs’. Turkey sees the leftist Kurdish YPG militia in Syria as a part of the Kurdistan Workers Party or PKK in Turkey. The latter is a terrorist organization according to the US, but the YPG is considered a US ally. 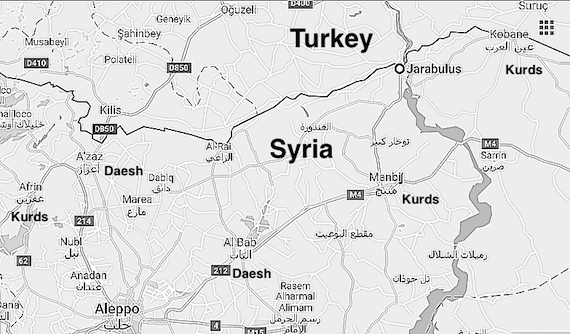 Kurdish sources also allege Turkish incursions near Kobane and Afrin. Afrin is the western-most of the three Kurdish cantons in northern Syria, and the Kurds are accusing the Turks of trying to keep it cut off from the others. US Syrian policy is in disarray despite the victories against Daesh in Manbij and Jarabulus. US allies on the ground– the Turks, the fundamentalist Syrian rebels, and the leftist, pro-US Kurds and their Arab allies– are now actively combatting one another, and a group backed by the Pentagon has just killed a Turkish soldier, which is to say, a NATO soldier.